The annual Montgomery Awards recognize the best in planning, design, and advocacy in Montgomery County, Pennsylvania. The program promotes awareness of outstanding design and innovative planning in our communities by awarding successful land developments, revitalization efforts, open space enhancements, environmental sustainability, and transportation improvements. It also recognizes citizens and organizations that have made significant and sustained contributions to planning in Montgomery County through a Planning Advocate Award. Bryn Mawr Village, an outstanding infill redevelopment project in Lower Merion Township, received a 2017 Montgomery Award for creative vision, effective site design, and successful collaboration. This impressive adaptive reuse project, a result of decade–long planning efforts and development initiatives, transformed a vacant, underutilized site located in the heart of the Bryn Mawr business district into a vibrant mixed-use center. The developer worked with the township and community to ensure the site development and design were consistent with the Bryn Mawr Village Zoning Ordinance adopted in 2008. 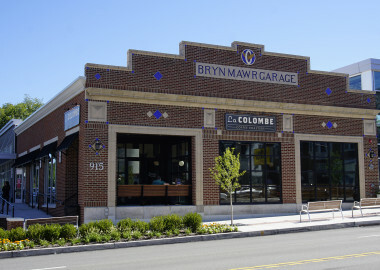 This involved promoting adaptive reuse of the garage, enhancing the village architecture and streetscape, and creating a pedestrian-friendly environment while accommodating a large 180-space parking lot consistent with the Bryn Mawr Master Plan. This shared vision and collaboration resulted in a distinctive commercial center that fits with its surroundings and connects to the larger business district. According to the award committee, Bryn Mawr Village is an excellent example of a well-designed infill redevelopment project. This new appealing retail and office space, which successfully created a more unified business district, serves as an economic catalyst for the community. Other winners in the program included Crossways Bridge & Trail, Lansdale Municipal Complex, Perkiomen School, SEPTA Parking Garage and Station, Abington Township Environmental Advisory Council, and Thompson Lexus Willow Grove. Read more about all of the winners at montcopa.org.